WASHINGTON, DC — The United States is facing an “escalating” threat from the use of civilian drones as weapons by the likes of the Islamic State (ISIS/ISIL) and MS-13, the FBI director cautioned on Wednesday. While describing shifts in the threat landscape more than 17 years after the 9/11 attacks on the United States, U.S. Department of Homeland Security Secretary Kirstjen Nielsen identified the use of civilian drones to advance nefarious activities as an example of emerging threats that are outpacing America’s defenses. Terrorists are using drones on the battlefield to surveil and to destroy; drug smugglers are using them to monitor border patrol officers so they can slip into America undetected; and criminals are using them to spy on sensitive facilities. The threat is real, and they can be used for a wide array of nefarious purposes. Russell Travers, the acting director of the National Counterterrorism Center (NCTC), a component of the Office of the Director of National Intelligence (ODNI), also highlighted the menace posed by the use of drones as weapons while testifying alongside Wray and Nielsen. 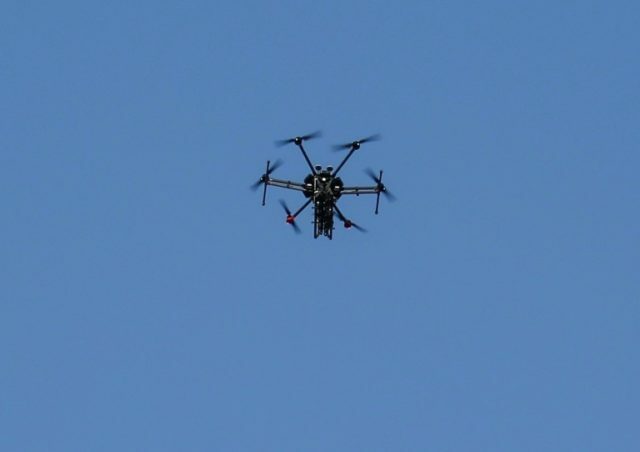 We are particularly concerned by their ongoing and future weaponization of more secure forms of communication, social media, unmanned aircraft systems (UAS), and weapons of mass destruction…an increasing number of terrorist organizations are making use of UAS for reconnaissance and surveillance, and we believe the use of this technology for kinetic operations will only grow. Nielsen noted that until recently the federal government lacked the authority to combat the growing threat posed by drones, officially known as unmanned aerial systems (UAS). Unfortunately, outdated laws have prevented us from setting up the sophisticated countermeasures we need to protect significant national events, federal facilities, and other potential targets from an airborne menace. DHS has lacked the clear legal authority to track and identify dangerous drones—and to neutralize them effectively if they are determined to be a threat. Furthermore, we have not been able to test many of the crucial countermeasures we need in real-world environments where the risks exist. According to Nielsen, the FAA [Federal Aviation Administration] Reauthorization Act of 2018, signed into law by U.S. President Donald Trump this week, will help DHS secure the authorities it needs to combat the drone threat. “It will give us the ability to better protect Americans against unmanned aerial threats. We have already begun planning in earnest for how to best deploy these authorities and defensive technologies to defend the United States against this emerging danger,” she explained, referring to the measure. U.S.-based homegrown violent extremists (HVEs) linked to jihadi groups like ISIS and al-Qaeda represent the top threat facing the United States, the witnesses testified. The U.S. government has also deemed transnational criminal organizations like Mexican drug cartels and MS-13 a prominent menace against the U.S.